Hope the week is treating you well. 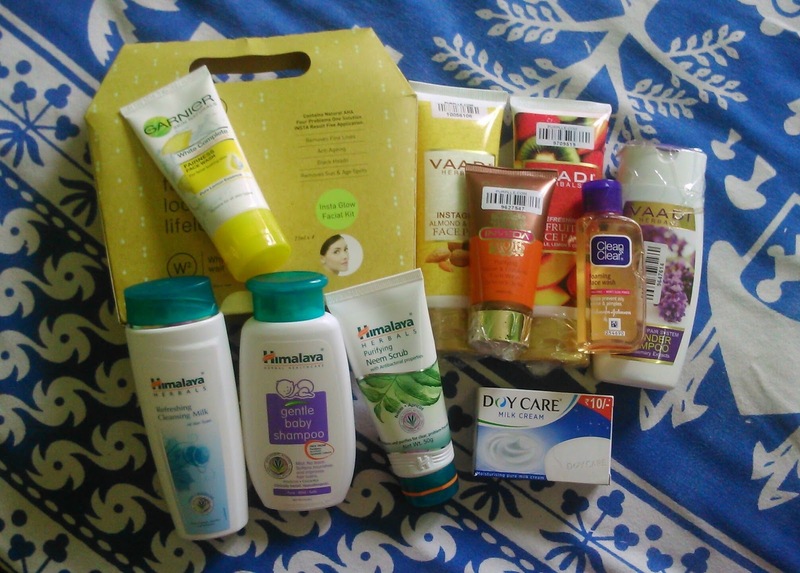 Today's post is about my skincare shopping haul from Purplle.com. There were discounts on some products, so I thought of shopping. I had been eyeing Vaadi Herbals, Himalaya Herbals and W2 brand quite for some time. So when there was a 20% off on Vaadi Herbals and 30% off on W2 brand I immediately placed an order. I placed my order on 15th Feb 2016 and my order was processed and delivered to me on 19th February 2016. That was pretty quick naah :). At every point I received a message on my smartphone regarding the status of my order. I am quite happy with my shopping experience from purplle.com. The contents were securely packed in bubble wrapping and the package reached me without any damage. So let's see what all I shopped for and what all I will be reviewing. I have never used the white range of Garnier so ordered this one. I have used Everyuth scrub all of my life, so thought of trying something new and ordered this one. This is my favourite shampoo currently, rather this is my second bottle. I oil my hair and shampoo them and it doesn't dry out my hair. Since summers are approaching I use this facewash as it doesn't dry out my oily skin and helps in preventing pimples. Currently am addicted to facepacks so ordered this one. This is the first product I am using from this brand. Let's see how it turns out to be. This kit was on offer and I immediately grabbed it. This is the first time I will try a facial kit at home. So this was what I shopped for. I will be using the products over a period of time and will review some of them soon.